Hurricane Sandy reared her ugly head and caused devastation along the east coast. She also caused deaths and injuries in Jamaica, Cuba and close to home. I never seen or experience anything like Hurricane Sandy (so close to home); subways, tunnels, airports and homes flooded. A family in MD did not properly ventilate their generator and ended up in the hospital. I’m so thankful that my family and loved ones are safe. My heart goes out to those who have lost ones or their homes. A positive from Hurricane Sandy is she brought out my “Susie Homemaker” side. I’ve been cooking and baking (chili, egg white omelet muffin, slutty brownies, sweet & salty bacon smokies…) THANK YOU PINTEREST! Regardless of how much I cook, my girls still want Chipotle. Ironic, I’m writing this review, I’ve cooked chili for dinner and the girls went out for Chipotle. They reminded me that my chili is EXTRA delicious on the second day:). I trek downstairs and select a French Chardonnay. I’m hoping this is an old-fashioned Chardonnay aka California Chard. An oaky, buttery, creamy Chardonnay is becoming distinct. It appears the wine industry prefers the stainless steel Chardonnays. It’s a delight when I find the best of both worlds: crisp apple tones with a butter creamy finish. Ooh, I have chills. It’s only 45 degrees outside. I want a red wine. But, I’m having an egg white omelet muffin (salsa and spinach) for dinner and a white wine would be a better match. Goodness, I digress. I always have to give a dissertation before talking about the wine. My feelings and environment plays a big role on my wine selection and enjoyment. YOU TRY IT! Taste a wine while you’re in a bad/funky mood. You’re enjoyment will be minimal or you will be displeased; unless, it’s just a “funky” wine:). 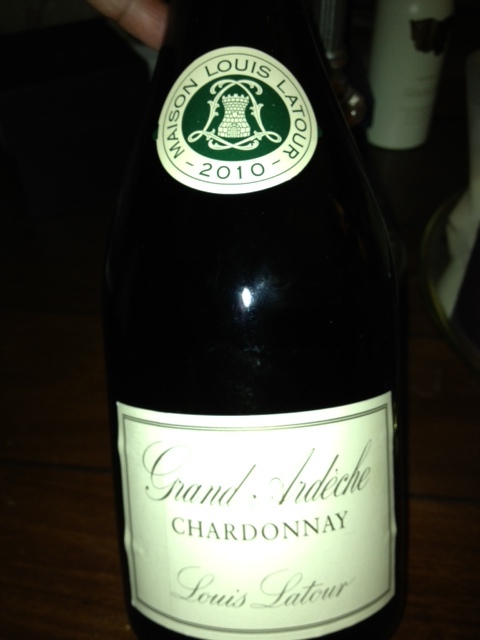 For those of you who have hung in here and still reading:), I poured a glass of 2010 Maison Louis Latour Chardonnay. This wine is elegant; citrus, apple flavors graces my palate. There isn’t any buttery or creamy finish, but I’m enjoying this Chardonnay. HA! I refer to the wine as elegant. I find the label to be elegant with its Grand cursive print. See how our environment plays on our enjoyment. I wonder if it had a cartoon label will I describe it as “fun”…makes you think:). I had a piece of slutty brownies, the flavors softened and the citrus flavors have enhanced. Yummy! So, here’s to another non-traditional Chardonnay!